WASHINGTON (CNN) -- Secretary of State Hillary Clinton on Tuesday demanded Hamas stop rocket fire into Israel and said she will send the Obama administration's Mideast envoy back to the region within weeks. 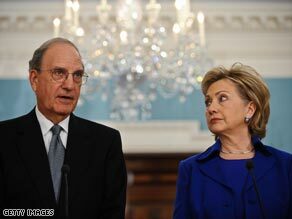 Secretary of State Hillary Clinton said she will send Mideast envoy George Mitchell back to the region within weeks. Israel and Hamas, the Islamic militant group that has ruled Gaza since 2007, declared separate, tentative ceasefires two weeks ago after more than three weeks of fighting. But, Clinton noted, "There were rockets yesterday, there were rockets this morning. It is difficult to ask any nation to do anything other than defend itself in the wake of that kind of consistent attack." Although she will send special Mideast envoy George Mitchell back to the region, she emphasized that "our conditions with respect to Hamas have not and will not change." Following the policy set out by the Bush administration and international community, Clinton said the United States will not talk to Hamas until it renounces violence, recognizes Israel and abides by previous agreements signed by Israel and the Palestinians. The United States does talk with leader of Hamas' rival Palestinian group, Fatah. Clinton's comments came as she spoke to reporters after meeting with Mitchell, who just returned from his first visit to the region in his new post. Mitchell, who was appointed by President Obama on his second full day in office, briefed Clinton on Tuesday on that visit and the steps he discussed with leaders toward attaining a sustainable and durable ceasefire in the Gaza strip. He said that while the challenges are difficult, he is convinced after his trip that "with patient, determined and persevering diplomacy, we can make a difference." "It is extremely difficult for all concerned there now, and they recognize widely that American diplomacy can and, I believe, will be helpful in resolving differences and moving forward toward the peace and stability that everyone wants," he said. Mitchell said he will be returning to the region before the end of the month and plans to "establish a regular and sustained regular presence" there. Clinton said Mitchell's trip was the first of an "ongoing high level of engagement" and promised the Obama administration will work with the Israelis and Palestinians to make progress on a peace deal that would "create an independent and viable Palestinian state in West Bank and Gaza," while providing security for Israel. The United States is looking forward to the results of this month's elections in Israel and to working with the new Israeli government, Clinton said. Clinton said she wants to make clear "to all parties who are concerned about the fate of children on both the Israeli and Palestinian sides that the United States is engaged, determined and committed to working with all who will work in good faith to solve the problems that are obviously afflicting that region." Mitchell said he told Clinton she should travel to the region soon because all of the leaders he met with were expecting her to visit.